The memorial to Parks turned her into a meek and redemptive figure—instead of the radical freedom fighter she was until the end of her life. 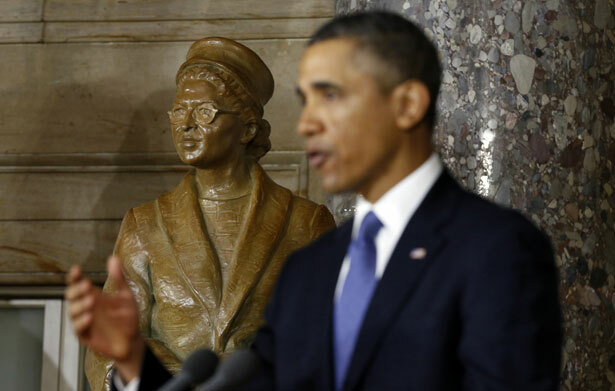 On Wednesday, President Obama and a bipartisan collection of congressional leaders paid tribute to the legacy of Rosa Parks by unveiling a statue of her at the Capitol. The nine-foot bronze figure of Parks desegregated Statuary Hall: hers is the first statue of a black woman to be installed at the Capitol and currently the only statue of a black person (a statue of Frederick Douglass is set to be moved there shortly). Yet, the statue of Rosa Parks—seated and clutching her purse—turned her into a meek and redemptive figure. To the end of her life, Parks believed the United States had a long way to go in the struggle for social and racial justice. Yesterday’s ceremony, however, was largely an exercise in national self-congratulation and a demonstration of American pride and pageantry. It invoked the history of racial injustice to put that history in the past. “The statue speaks for itself,” House Speaker John Boehner began, noting how its placement in the hall embodied “the vision of a more perfect union.” “What a story, what a legacy, what a country,” Senator Mitch McConnell extolled at the close of his remarks. As these words were spoken, across the Washington Mall, the Supreme Court heard arguments challenging provisions of the 1965 Voting Rights Act in Shelby County v. Holder. Only one speaker at the dedication, Representative James Clyburn, made specific reference to the case, which threatens to undermine the gains that Parks helped bring about. A day after Rosa Parks died in October 2005, then-Senator Obama warned against “limit[ing] our commemorations to lofty eulogies.” “Instead,” Obama implored, “let us commit ourselves to carrying on her fight, one solitary act at a time, and ensure that her passion continues to inspire as it did a half-century ago.” On Wednesday, while noting that Rosa Parks’s activism didn’t end with the bus boycott, President Obama reflected, “that moment tells us something about how change happens, or doesn’t happen; the choices we make, or don’t make…. Whether out of inertia or selfishness, whether out of fear or a simple lack of moral imagination, we so often spend our lives as if in a fog, accepting injustice, rationalizing inequity, tolerating the intolerable.” These are lofty words, and yet it must be noted that they were just that; the President made no “solitary act,” introduced no legislation or executive orders to further the struggle of racial justice. The dedication itself rested on a fuzzy, feminized idea of Parks as a mother figure, “the first lady” of the civil rights movement. “She did what was natural,” House Minority Leader Nancy Pelosi quoted Willie Mays in her remarks. “She was tired, so she sat down.” This image of passive resistance obscures the widespread opposition to the black freedom movement—Parks, for example, was called “un-American” for her extensive political activities—in favor of honoring America’s “great regenerative capacity.” Most importantly, the dedication skirted over the enduring scourge of racial inequality, a reality that Parks continued to highlight and challenge until her passing. A fuller accounting of Parks’ political life offers a different set of reasons for the national honor and a different responsibility to her legacy. Laboring in the 1940s and 1950s in relative obscurity, Parks was among a small group who sought to transform Montgomery’s NAACP into a more activist branch. They pushed for black voter registration, legal justice and school desegregation, and Parks traveled the state documenting white brutality and legal malfeasance. Knowing well the cost of bus resistance—a neighbor of Parks had been killed for his resistance—and having made numerous personal stands against segregation that went nowhere, Parks understood the danger and likely ineffectiveness of her stand. And yet, “pushed as far as [she] could be pushed,” she did it anyway. When, to her surprise, her arrest galvanized a mass movement, she worked hard to sustain it over the next year. Her stand led to significant economic and personal hardship for her family. In the early days of the boycott, both Rosa and Raymond Parks lost their jobs, and the family faced hate calls and death threats, which continued even after the boycott’s successful finish. Eight months after the boycott ended, still unable to find work, in poor health and continuing to face death threats, the family left Montgomery for Detroit. There, Rosa Parks did not rest; she joined new and old comrades to fight the racism of the Jim Crow North. Describing the city as the “promised land that wasn’t,” the Parks family found racism in Detroit “almost as widespread as Montgomery.” Having volunteered on John Conyers long-shot political campaign for a new congressional seat in Michigan in 1964, Parks was hired in 1965 to be part of his Detroit staff, where she worked on issues such as police brutality, open housing, welfare and job discrimination—the plagues of northern racism. It is this extensive legacy that was reduced to a caricature—a tired seated seamstress placed in the halls of the Capitol—instead of a standing, resolute, lifelong freedom fighter. Back in December, on the anniversary of her bus arrest, the president tweeted a photo of himself taken on the Rosa Parks bus in the classic Rosa Parks pose—placing himself in her legacy. But fully honoring Rosa Parks means fighting for what she spent her lifetime fighting for—a criminal justice system fair and just to people of color, unfettered voting rights, educational access and equity, real assistance to the poor, an end to US wars of occupation and black history in all parts of the curriculum. Placing ourselves in her legacy—as President Obama did—requires something more of us as a nation than dedicating a statue. Rosa Parks’s courage was the ability to make an independent stand, even though she and others had done it before and nothing had changed, and even when she well understood the harm that might befall her—and to make those stands over and over throughout the course of her life. She asks the same of us. Marwa AmerMarwa Amer is a doctoral student in the history department at the University of Massachusetts, Amherst.